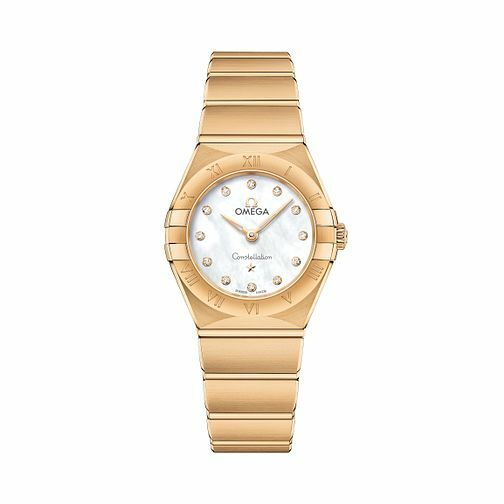 Introducing the chic Constellation Manhattan ladies' timepiece by Omega, with a 25mm case and bracelet crafted from 18ct yellow gold. A pure white mother of pearl dial features opulent diamond hour markers, placed in luxurious yellow gold holders. The roman numeral engraved bezel, hands, Omega logo and Constellation star are also presented in 18ct yellow gold. A stamped Constellation Observatory medallion is presented upon the caseback for the final touch. Boasting water resistancy up-to 30metres, this swiss made watch combines classic with contemporary, the modern lady's timepiece.